Covering 70% of the world’s surface the sea is home to some of the most unusual, mysterious and deadly animals on the planet. As humans are not native to the oceans this makes us easy pickings for many of these creatures, although thankfully we are largely off the menu..
As someone who has spent plenty of time bobbing around on the surface of the sea my mind has often drifted to what lurks below. Fortunately the statistics provide some comfort and it is apparently quite rare to be eaten alive whilst frolicking in the ocean. However, I expect that’s what all those people who did get eaten were thinking, and lets face it, it’s a pretty unpleasant way to go. In this selection of the world’s most dangerous sea creatures I have tried to balance the statistics with the potential to kill and aggression of these animals. The list contains a huge range of species from tropical jellyfish to killer seals of the Arctic. Many of you will have come across sea urchins at some point, and some will have found out the hard way what those sharp spines are for – I certainly have. 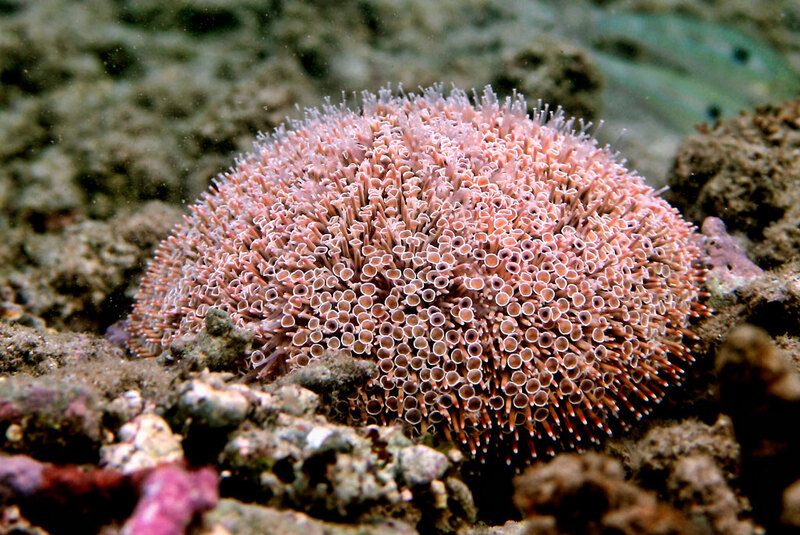 However, the flower urchin (Toxopneustes pileolus) is in a league of its own when it comes to defensive weaponry. Described by the Guinness Book of Records as the world’s “most dangerous sea urchin” this is one echinoderm you don’t want to be standing on. What makes this urchin deadly is the potent venom it is armed with. This venom contains at least two dangerous toxins; Contractin A, a neurotoxin which causes spasms of the smooth muscles, and peditoxin – a protein toxin which can cause convulsions, anaphalactic-type shock and death. The venom is delivered via the pedicellariae – these are the flower-like structures that give the urchin its name. Once contact is made with the skin the pedicellariae often break off and continue pumping poison into the victim. Apparently the size of these pedicellariae is directly related to the potency of the venom. At that time, 7 or 8 pedicellariae stubbornly attached themselves to a side of the middle finger of my right hand, detached from the stalk and remained on the skin of my finger. Instantly, I felt a severe pain resembling that caused by the cnidoblast of Coelenterata, and I felt as if the toxin were beginning to move rapidly to the blood vessel from the stung area towards my heart. After a while, I experienced a faint giddiness, difficulty of respiration, paralysis of the lips, tongue and eyelids, relaxation of muscles in the limbs, was hardly able to speak or control my facial expression, and felt almost as if I were going to die. 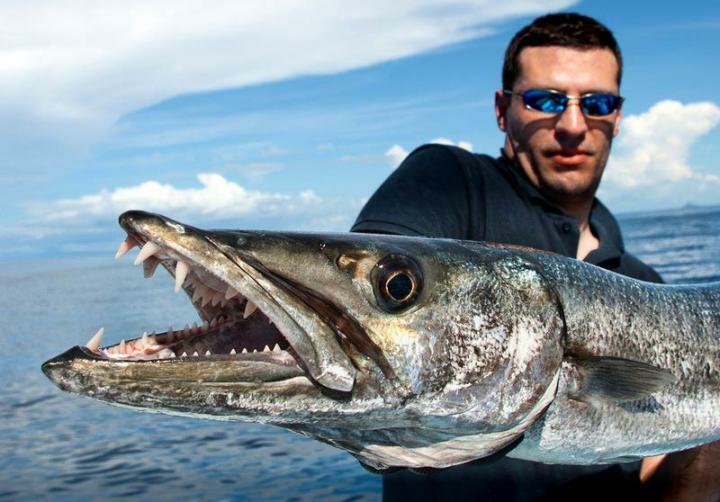 The photo above should be quite self explanatory as to why the barracuda makes it on to our list. Measuring up to 6ft (1.8m) in length and armed with a terrifying array of super-sharp teeth, the torpedo-like barracuda is more than capable of inflicting serious injuries. There are actually 22 species of barracuda but it is only the great barracuda (Sphyraena barracuda) that has been known to attack humans. The barracuda’s diet consists mainly of small and medium sized fish. It uses its lightning speed and ambush tactics to catch them. Many of the recorded attacks on humans seem to have involved shiny objects such as jewelry or even diving knives. Apparently the barracuda are attracted to these, confusing them with prey fish and strike. Such attacks can leave the victim with deep gashes, often resulting in nerve and tendon damage or in the worst case severing blood vessels. These injuries can require hundreds of stitches to patch up. On rare occasions barracudas have been known to leap out of the water and cause serious injury to people in boat. One recent case in Florida left a female canoeist fighting for her life after suffering broken ribs and a punctured lung after a barracuda attack. If all that hasn’t convinced you the barracuda should be on this list there is one more thing. 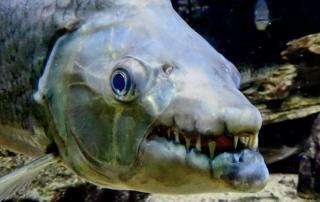 Barracuda’s may have the last laugh as their flesh sometimes contains the ciguatera toxin which can cause serious symptoms that last for months. The cone snail has been a favourite among shell collectors for centuries, but don’t be fooled by its pretty appearance, these snails are killers! Armed with tiny harpoons formed from modified teeth these critters can fire a hollow barb loaded with deadly neurotoxins in any direction. The harpoon of some of the larger species of cone snail is big and powerful enough to not only penetrate human skin, but gloves or wetsuits too. A single drop of the cone snail’s venom is said to be sufficient to kill 20 men making it one of the most venomous creatures on earth. Known as conotoxins the poison can be highly specific affecting only certain types of nerves. Whilst this may be of medical interest, the stings generally cause intense, localized pain with the life-threatening symptoms sometimes taking several days to present. On the other hand, rapid paralysis of the respiratory system and death can occur shortly after the sting. 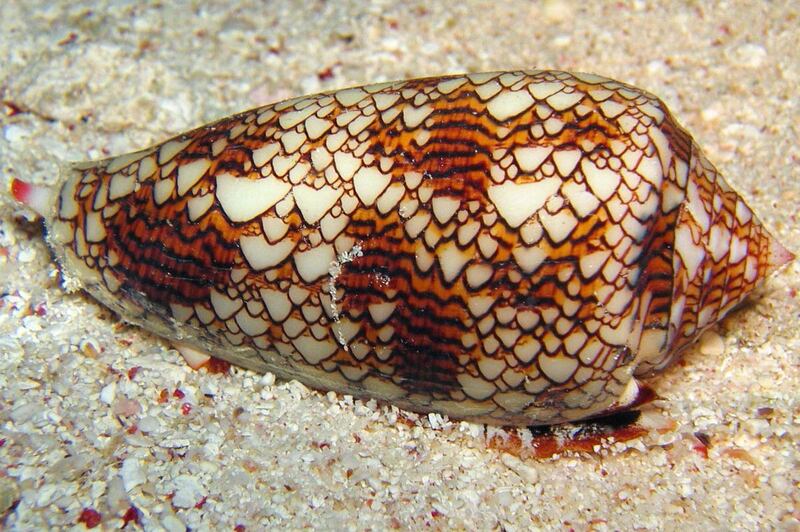 In fact, one species of cone snail is known locally as the “cigarette snail” on account of there being just enough time to smoke one before you die! Despite there lethal venom cone snails have only been responsible for a handful of deaths over the years which is why they only occur at number 9 on our list. 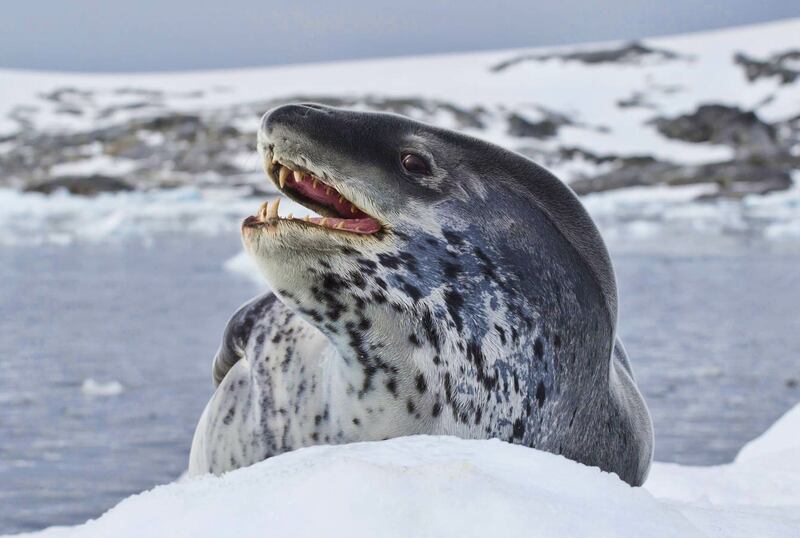 The leopard seal (Hydrurga leptonyx) is actually named for its spotted coat although it could have easily been for its fierce nature. Sitting right at the top of the Antarctic food chain this seal is one of the biggest seals in the southern oceans. Measuring up to 4 m (13 ft) in length and weighing in at up to 600 kg (1,320 lb) the leopard seal is a formidable predator. In addition to its size and speed these seals are also armed with a huge mouth (big enough to fit your head in!) lined with big, pointy teeth set in a head that looks more reptile than seal. On the leopard seal’s menu are other species of seal, seabirds, penguins and fish, although they are also known to sieve krill and small crustaceans out of the water too. These seals usually hunt by waiting in ambush just below the ice shelf where seals or penguins are entering the water at which point they pounce. Given that this seal is only found in the frigid waters of the far southern oceans it doesn’t come into contact with humans often at all. This makes it all the more shocking that a leopard seals have killed people. Back in 1914, during Sir Ernest Shackleton’s Endurance expedition a leopard seal had to be shot as it chased down crew member Thomas Orde-Lees. The seal first chased Orde-Lees across the ice before diving under the ice sheet and tracking him from below. After the seal popped up ahead of Orde-Lees another member of the team managed to shoot the seal dead. In 2003 a British scientist was less fortunate. Kirsty Brown, a 28-year-old marine biologist working with the British Antarctic Survey, was snorkelling off the Antarctic Peninsula when she was attacked by a large leopard seal. The seal dragged the scientist deep underwater where she drowned. Whilst there are many other stories of leopard seals harassing people in boats this is the first recorded fatality. I got spiked on the finger by a Stonefish in Australia … never mind a bee sting. … Imagine having each knuckle, then the wrist, elbow and shoulder being hit in turn with a sledgehammer over the course of about an hour. Then about an hour later imagine taking a real kicking to both kidneys for about 45 minutes so that you couldn’t stand or straighten up. I was late 20s, pretty fit physically and this was the tiniest of nicks. Got sensation back in my finger after a few days but had recurrent kidney pains periodically for several years afterwards. 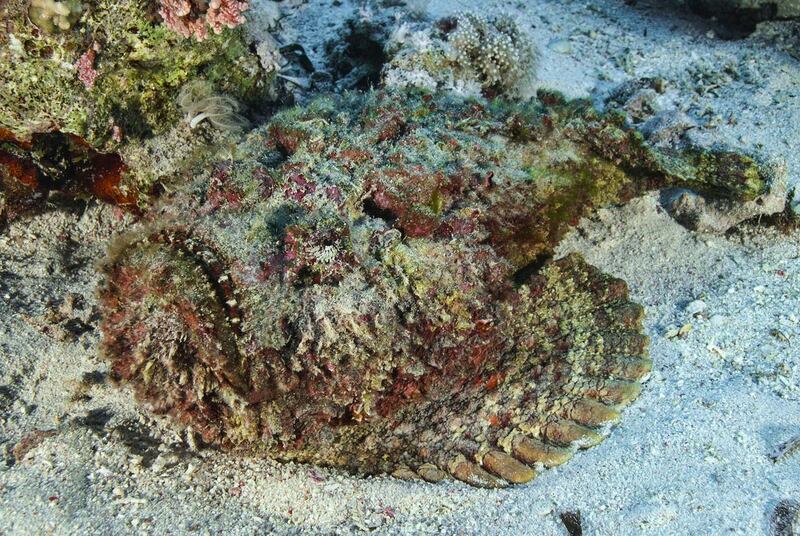 For obvious reasons most people get stung on the foot by stonefish. Whilst this may just bring a new definition to pain, those unlucky enough to get stung on the body can be in big trouble. Such stings are potentially fatal with the venom causing respiratory paralysis and possibly heart failure. In serious cases urgent medical attention is required and victims will need treating with the antivenom. In fact this is the second most frequently administered antivenom in Australia and this has meant no one has died of a stonefish sting there for nearly 100 years. Instantly recognizable by their iridescent blue rings, these little octopuses spends most of their time hiding in crevices or camouflaged against coral reefs of the Pacific and Indian Oceans. 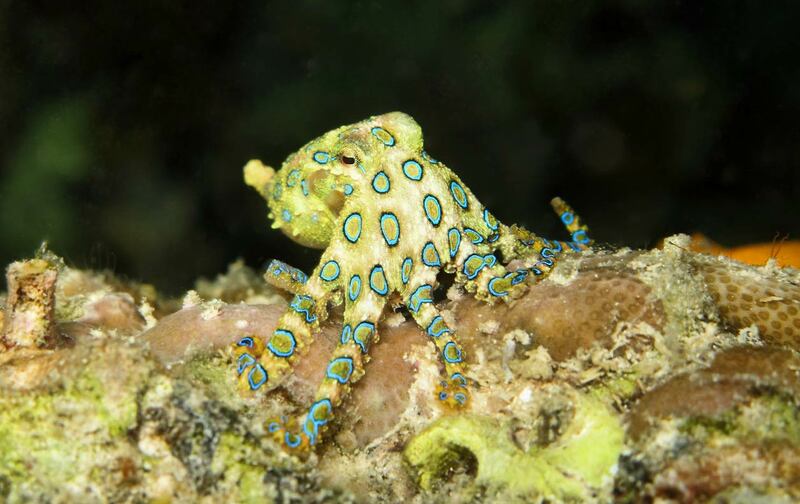 It is only when threatened that the blue-ringed octopus really lives up to its name and shows its true colours. Then its skin becomes a bright yellow and the blue rings even more vivid, almost appearing to shimmer. Beautiful as this display might be it is also a warning that this is one of the most dangerous animals in the ocean. What makes this octopus particularly dangerous is its venom. All octopus have venom, but that of the blue ringed octopus is in a league of its own. Known as TTX (tetrodotoxin) this incredibly strong neurotoxin is the same as that found in arrow poison frogs and pufferfish. At around 1200 times more potent than cyanide it only the slightest nick from a blue-ringed octopus can be fatal. In fact many victims claim not to have even felt the bite itself. It is said an average specimen weighing around 30g contains enough poison to kill over 10 adults. There is no effective antivenom for a blue-ringed octopus and the neurotoxin works by paralysing the victim. It is similar in effect to the medicinal curare which is used to immobilise patients during operations and whilst alert, those under the influence may be unable to speak or move. The main danger is that it paralyses the lungs causing the victim to suffocate. Swift treatment is essential in serious cases and this involves putting the victim on life support until the effects of the poison wear off and unassisted breathing is restored. 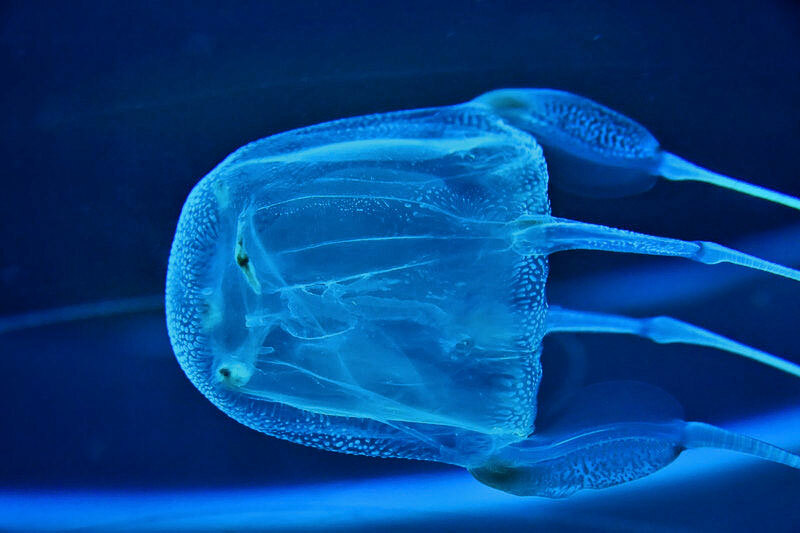 Box jellyfish are a number of species that get their name from their cube-shaped bodies. Many of the box jellies have particularly venomous stings with the large sea wasp (Chironex fleckeri) having the most powerful sting of all. Found along the northern coasts of Australia and tropical South East Asia, the sea wasp is widely regarded as “the most lethal jellyfish in the world” having caused over 60 deaths in Australia alone. In other regions the death toll is likely to be much higher, particularly where antivenom is not readily available. The sea wasp’s venom of the is the second most powerful of any creature on Earth with only the geographic sea cone more venomous. Estimates suggest that each animal contains enough venom to kill 60 adult humans and very few animals can cause death so rapidly. In extreme cases death by cardiac arrest has been known to occur less than five minutes after being stung. The sting itself causes excruciating pain along with a burning sensation likened to being branded with a red hot iron. The (sort of) good news is that contrary to popular belief, urinating on the sting has no discernible effect! In many cases the tentacles remain attached to the victim and can continue stinging even after they have left the sea often leading to scarring. At the other end of the size scale is the tiny Irukandji jellyfish. These widespread and little understood box jellyfish have a powerful venom that can result in Irukandji syndrome which gradually appears after the sting itself. 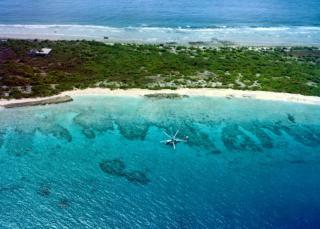 As well as being potentially fatal Irukandji is reported as being unbelievably painful. One victim said it started out as worse than childbirth and got more intense from there on. Sea snakes include a variety of species which occur mainly in tropical waters of the Pacific and Indian Oceans. It is believed that they evolved from land snakes in Australia (of course!) and adapted to living in shallow coastal waters by developing a huge left lung, stretching the length of most of the snakes body. 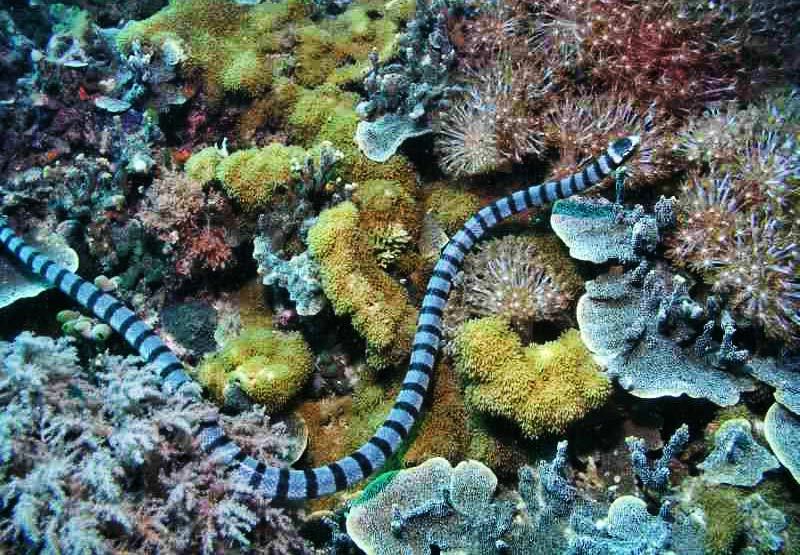 Being closely related to land-based cobras and kraits it is little surprise that many sea snakes are highly venomous. In fact what is surprising is that their venom is much more potent than their land-living cousins. The reason they are so venomous is they eat fish; this means they need to quickly immobilise their prey to prevent it escaping or injuring them. Now, I expect most of you have heard that despite their lethal venom, sea snakes are harmless as they only have tiny mouths. This, it turns out, is a complete myth! It is true sea snakes have small fangs and don’t have huge mouths, however they are capable of swallowing fish whole and can easily envenomate a human, even through a wetsuit. There are actually two reasons why sea snakes are considered far less dangerous than land snakes; firstly they are generally shy and far less aggressive. In addition they usually deliver a “dry” bite, i.e. no venom is injected. In the unlikely case a person gets a venom loaded bite the good news is there is a specific antivenom. If this is not available Australian tiger snake antivenom is also effective. Of all the species of sea snake there are two which merit a mention. The beaked sea snake is one of the most venomous snakes on earth. Its venom is said to be nearly 8 times as strong as that of the cobra with one drop able to kill three men. It is also reputed to be more aggressive than most other sea snakes. The venom of the beaked sea snake contains both neurotoxins and myotoxins; whilst it is the former that will kill you through respiratory paralysis the latter breaks down muscle causing excruciating pain. Despite its attributes there have been few fatalities caused by this snake as it is more commonly found in deeper water. Most bites have been to fishermen whilst emptying their nets. The other sea snake worthy of mention is Belcher’s sea snake if only because it is often cited as having the most powerful venom of any snake. I have seen it claimed that the venom is 100 times more potent than even that of the inland taipan. This is probably somewhat of an exaggeration, but the venom is definitely up there with the taipan. The good news is Belcher’s sea snake is often described as having a “friendly” nature! The saltwater crocodile is no stranger to the pages of Planet Deadly. Lethal on both land and sea, this behemoth is the largest species of extant reptile and a living throwback to the dinosaurs. The largest specimens recorded have measured around 7 metres (25ft) and weighed nearly 2 tons although in the 1950s one crocodile measuring 8.5 metres (30ft) was allegedly caught near Darwin in Australia. Along with its size comes massive power; the saltwater crocodile has the most powerful bite on earth – 10 times that of the great white shark. They’re quick in the water too, swimming at up to 18mph (27km/h). On land they aren’t quite as fast as urban legend would have us believe but they can explode into action quicker than you can react. Although most people associate the saltwater crocodile with Australia it has a wide distribution and has reeked more havoc in other parts of its range. The saltwater croc can be found throughout Southeast Asia and as far west as India. Crocodiles have also been known to swim great distances with individuals being spotted as far away as Fiji and New Caledonia. 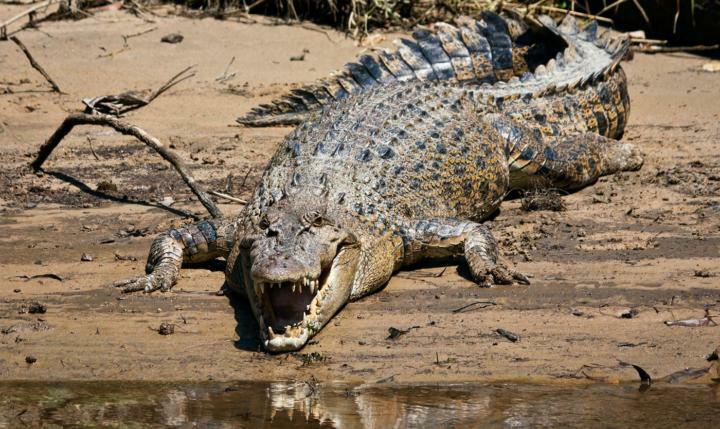 In Australia there are on average two deadly attacks by saltwater crocs a year. Elsewhere attacks are harder to quantify but studies indicate they are much higher with up to 30 a year. …Of about one thousand Japanese soldiers that entered the swamps of Ramree, only about twenty were found alive. Not too many surprises here then! As one of the ocean’s apex predators sharks are generally well equipped to inflict serious injury; large, fast, powerful and armed with row upon row of razor sharp teeth these fish are finely honed killing machines. However, despite there being around 400 species to choose from it is only a handful that present any real danger to humans. I have weighed up the most dangerous sharks in the world in another article but still find it difficult to choose from the top four. On the one hand there is the great white shark – hands down the most capable killer of all living sharks. Measuring up to nearly 8 metres (25ft) in length and 3 tons in weight the great white lives up to its name. Its favourite attack tactic is to get below its prey and then head up at top speed (35mph/55kph) with mouth open presenting its fearsome array of dagger like teeth. The statistics partly support the great white’s status as the ocean’s deadliest creature with around 400 recorded attacks of which roughly 20% were fatal. However, a closer look at some of the other shark species shows they present their own specific dangers. The bull shark has a slightly higher kill rate of around 25% and it is believed that many attacks are either wrongly attributed or not recorded. The bull shark’s trump card though is its ability to survive in fresh water. These sharks have been found thousands of miles up rivers throughout the world, where no one was really expecting to see them. They have even been found in lakes that only have seasonal access to the sea. 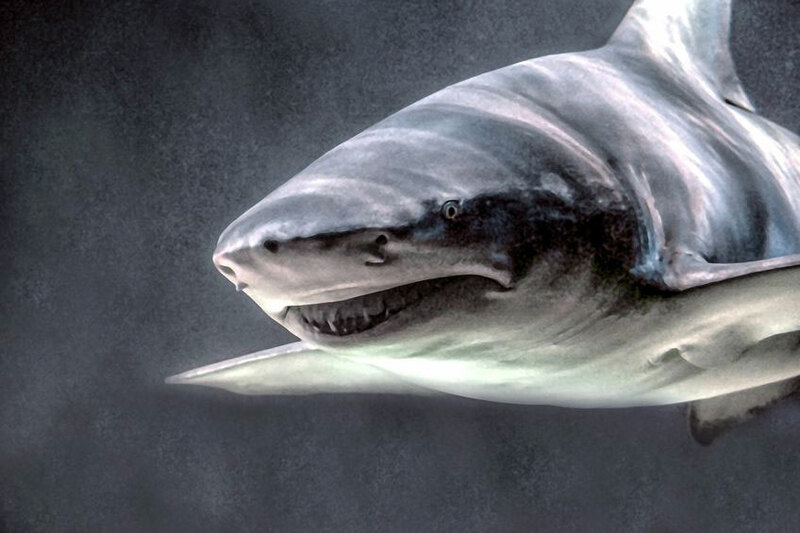 It also seems that bull sharks, like tiger sharks, are a lot less picky about what they eat. Whereas most great white attacks seem to have been mistaken identity, the bull shark will consciously attack humans. One other species of shark to bear in mind is the oceanic whitetip. Whilst the statistics don’t support it anecdotes do with legendary naturalist Jacques Cousteau describing them as “the most dangerous of all sharks”. It is these sharks that are believed to have been responsible for hundreds of deaths in air and sea disasters. The most notorious cases date from World War II with the loss of the Nova Scotia off South Africa and the USS Indianapolis off the Philippines. Although there are no accurate records estimates put the total deaths from shark attack at around 1,000 for these two disasters. where is the mantis shrimp??? WHAT ABOUT THE BOX JELLYFISH!!!!!!!!!!!!! You don’t think I’d forget that nasty little critter. Personally I think orcas are the deadliest. They have no predators and they hunt in groups. In addition to being smarter than and bigger than great whites, they actively hunt great whites. I agree with you, karl donitz because sharks are some of the most misunderstood animals in the world. Everyone thinks that sharks are here to attack us for a sport or something, but what is really happening is us humans have been going into their territory so they are just trying to protect their young and the females. Plus, you are more likely to get killed by a toaster than get killed by a shark. OK, but this is not an article about toasters. As for protecting their young and females, you clearly know nothing about sharks. Attacks are either territorial or mistaken identity. Sharks come near our beaches searching for food because we are taking all their fish. In white shark attacks here in California it’s almost always a case of mistaken identity. Dark wet-suits worn by surfers make them resemble seals. Once the shark discovers the mistake they usually spit them out, but by then it’s often too late. Um, in case you didn’t know, sharks rarely care for their own species. Most types are loners, and many have been known to eat their offspring. So saying that they protect their females is quite wrong. They couldn’t care less. Seriously? Sharks kill like 12 people each year, and humans kill 300,000 sharks each year. This is a lie. Sorry, which part is a lie? Are sharks not the most dangerous creature in the sea? Or are you saying humans are sea creatures?! 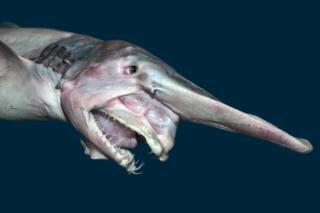 If crocodiles can be sea creatures then humans can be classified as such. I suggest we a semi pelagic. Yeah no. Humans are land animals bud. Once we start spending 70% of our lifetime in water then maybe we can consider ourselves sea creatures.